I was a guest on the podcast SciFi Saturday Night! I talk with host Dome about my “career,” if you can call it that. A strange but I think enjoyable experience. I think. Anyways, listen to me drone on and behold the splendor of my provincial accent, if that’s your thing. Thanks to the SciFi Saturday Night team for the invite. Ethan Hawke cuts a lean figure in the equally lean and potent First Reformed from writer and director Paul Schrader. Hawke stars as Rev. Toller, a pastor tending to the needs of a cold little church in a cold little town in upstate New York. The parish has its 250th anniversary celebration approaching, and multiple sets of prying eyes from the mothership megachurch organization (think corporate bureaucrats more than priests and nuns) are focused on all aspects of the event. It quickly becomes clear that Hawke’s Rev. Toller is something of a black sheep in the church hierarchy, and his direct supervisors are anxious about his ability to successfully pull off the proceedings. Then there’s also bits about the role of God, the Iraq War, fear, alcoholism, suicide bombings, capitalism run amok, and the fate of the entire planet. The ‘70s grit and localized urban violence found in Taxi Driver are gone, because, well, they don’t really exist anymore. But Schrader deftly weaves in the many frightening aspects of today’s global level of violence- extremist groups, the online world, substance abuse, suicide, greed, corruption, and a general pervasiveness of amorality- in the same way he channeled freaks, weirdos, and revolvers in Taxi Driver. The chief antagonist, if it can be called that, is the idea of a global climate crisis. Indeed, though the story is set in a small church in a small town with a small cast of characters, Schrader presents something out of a superhero plot- the destruction of the world itself – and makes it real. He’s mostly successful. Some bumps in the road: First Reformed often feels cut a bit too close to the bone, like the version we’re seeing on screen is either the first draft or the 151st, a combination of either whittled away too much or not flushed out enough. The chief victim of this is the character played by Amanda Seyfried. Seyfried acts with a kind of earnestness that is captivating, but unfortunately she’s not given much of a story on her own. Her husband is a troubled environmentalist radical. Why exactly she is with him, given her lack of radicalism on the subject, isn’t really explained, nor are her reasons for seeking the help of Hawke’s character explored to any depth. She exists primarily as a prop for Hawke’s Reverend Toller to explore pretty typical yearnings of a middle-aged man. Hawke and Seyfried have a real chemistry together, and it’s a shame it doesn’t get more time or substance. What Schrader does accomplish though is pretty remarkable in the sense that it attempts to both boil the ocean and thread the needle at the same time. Schrader takes a deep breath and goes for big, weighty subject matter questions, but where those aspirations threaten to slip over the edge into arthouse pretentiousness or, well, preaching, the movie instead remains ever-so precariously grounded and more importantly, interesting. This is in large part because of the restraint of the script, which although hollow in a few spots, is also sharp and quick enough to not spend too much time dwelling on any one of the many aspects it tackles. In a word, it is restrained, giving the audience plenty to think about but never so much that it blocks the very strong performances of the cast. Hawke in particular gives a lean and mean performance, one of the best of his career, which serves to make the film’s high-concept statements and philosophical tangents more earthy and real. The ensemble of supporting cast members, including a standout serious turn from actor/comedian Cedric the Entertainer as a megachurch management drone, also does wonders in bringing Schrader’s kaleidoscopic view of a world on fire into a crystalized whole. Schrader’s script for Taxi Driver, brought to life by Martin Scorsese and Robert De Niro, swept up many strands of the violent America of the 1970s into one strange package, a fierce and pointed thrust that spoke directly to its time. First Reformed does much of the same with a very different world of the 21st century. Schrader reminds us of the toll of recent times, from terrorism to the wars to the current state of anger and fear-driven politics, to the absence of grace, compassion, and civility. There are swings toward the abstract, poetic, and nearly psychedelic that won’t sit well with those looking for a traditional drama yarn. 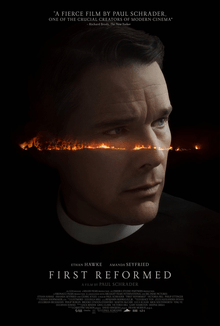 But those choices aside (or because of, depending on your tastes), First Reformed is a powerful piece of filmmaking that takes the template of a singular story and uses it communicate multiple complex feelings on life, God, America, the world, and more (as if that’s not enough), and showcases truly excellent performances from its cast. It’s an angry, powerful, and violent film, much like Taxi Driver before it, but at a modulation and scale that brings the frenzied state of the 21st century’s hyper-polarized, information overload world into a cool and clear focus. There’s a lot to process and it’s not for the faint of heart, but for those unsettled by the trajectory of current events, Schrader’s First Reformed will hit home in ways that are scary, moving, and fascinating. I just wrapped 3 days at Northeast Comic Con in Boxboro, MA. I didn’t know what to expect from this show– it was my first time doing it, and it fell on the weekend following Thanksgiving. Would anyone be around? Would Black Friday and football syphon off any interest? Would people be too hungover from turkey and gravy to move from their sofas? Much to my surprise, the crowds were constant and enthusiastic throughout. The Con kicked off Friday evening and new readers quickly stopped by the table and picked up anthologies and comics. I had some great conversations with people genuinely interested in finding new and interesting things in the comic world– a less common occurrence at conventions than you might think. The strong Friday start provided a solid boost to the rest of the weekend. Saturday and Sunday were equally bustling, with moderate yet steady crowds filing through in intermittent bursts. I took a brief pause from my table on Saturday to engage in something of a lifelong dream. Peter Laird, co-creator of Teenage Mutant Ninja Turtles and indie comic legend, was in the house. Mirage Studio stalwart Steve Levigne was also there. Laird’s TMNT and the DIY/self-publishing ethic made famous by Mirage in the ’80s serve as my guiding light, the template and inspiration for my books CRISIS VECTOR and CRYPT ZERO. Meeting Peter Laird was, suffice to say, pretty surreal. The word hero gets thrown around a lot, but in this case there’s no better term I can use. He was generous and kind. A perfect experience that I’ll remember forever. Here’s me with the man himself! Other highlights include a whole lot of conversation about Famous Monsters of Filmland. This weekend marked the birthday of Famous Monsters founder Forrest J. Ackerman, and let me tell you, Forry’s spirit is alive and well. So many people have fond memories and recollections of their experiences reading Famous Monsters. For some, it was decades in the past and their smiles were those of reencountering an old friend. Others found back issues in more recent years and discovered the world of cinematic creatures through musty yellowed pages. 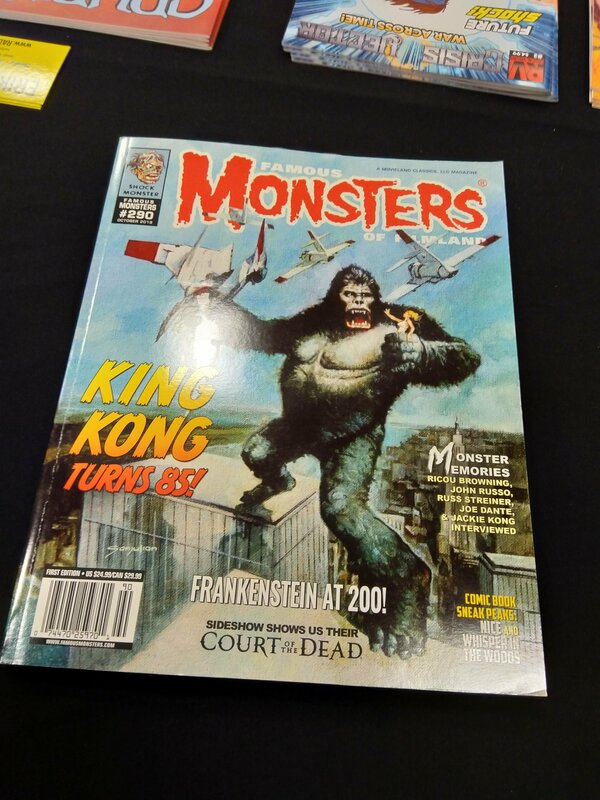 And then there are the new generation of readers (my personal favorite), seeing the Famous Monsters logo for the first time and feeling a magical pull to crack open the glossy cover and dive into a whole new world. I was especially touched by a young man of about 12 or 13 who came by a few times, eventually returning with his father and grandfather. He was sporting a full Ghostbusters uniform, as was his dad, and he was clearly fixated on Famous Monsters. I should note here that I’m not much of a carnival barker or salesperson at cons. I generally let people discover the work on their own and then engage in a conversation if there’s one to be had. Just the way I roll. Anyways, this young man found something in Famous Monsters, and it was cool be a spectator, watching the tractor beam activate between reader and source. That young man’s Famous Monster’s memories begin with Famous Monsters #290, published just last month. Maybe it turns into a lifetime of memories. It’s an honor to play a small role in something like that. I also was blessed by the patron diety of comic cons to once again have great table neighbors. I was happy to meet Paul Montani, writer and artist of THE RAT RACE, a fantastic looking cartoon strip featuring, you guessed it, rats. Turns out Paul and I work for the same mega-corporation as our day gigs, and I really enjoyed sharing war stories and reflections about everything from local comic shops to new Disney rides with him throughout the weekend. I was also excited to see Patrick Davis, Topps Star Wars artist extraordinaire. 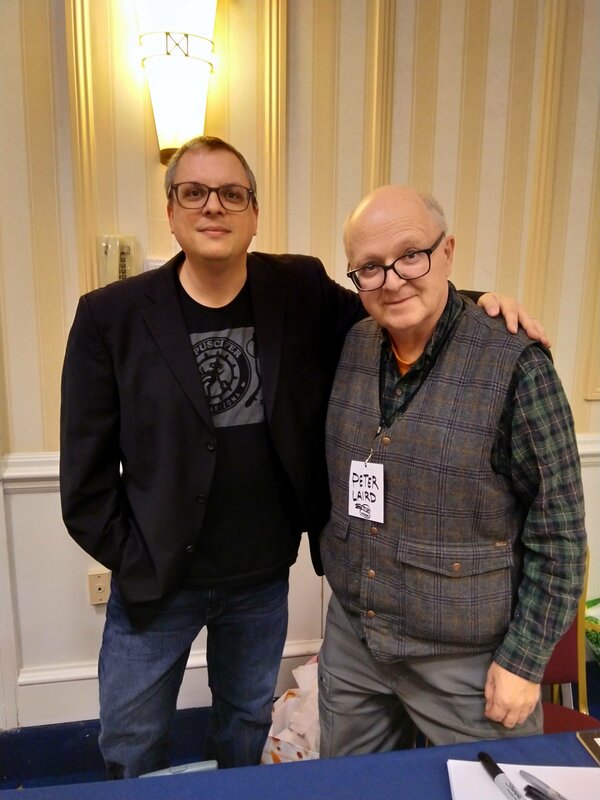 I recently met Patrick at That’s Entertainment’s MicroCon in Worcester, and we hit it off with our deep, perhaps unhealthy love of Star Wars. 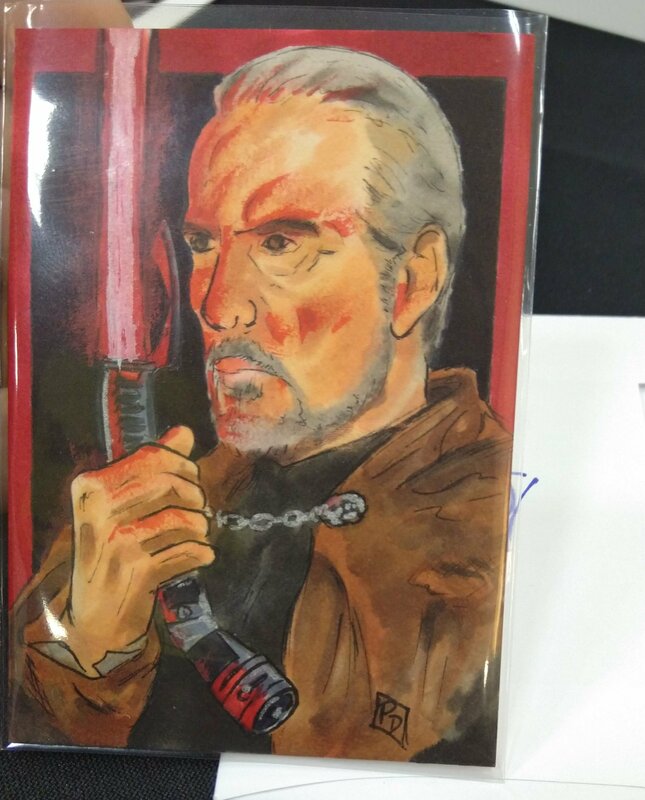 Patrick produced a stellar piece of my boy Count Dooku for me, and I shall treasure it always. Ok, this is already longer than expected so I’ll close by saying great show, great crowd, and a hearty thank you to everyone who attended and picked up my comics and stories. Also shoutout to organizer Gary and the Northeast Comic Con staff. So. See that cover? See those names? Brian Michael Bendis. Kieron Gillen. Jim Zub. Amy Chu. And more! That’s me. I’m the “and more!” !!! I’m very excited to announce that I have an essay/prose piece in this tremendous looking anthology project, helmed by editor Hope Nicholson and coming to comic shops and bookstores everywhere from Dark Horse Comics. 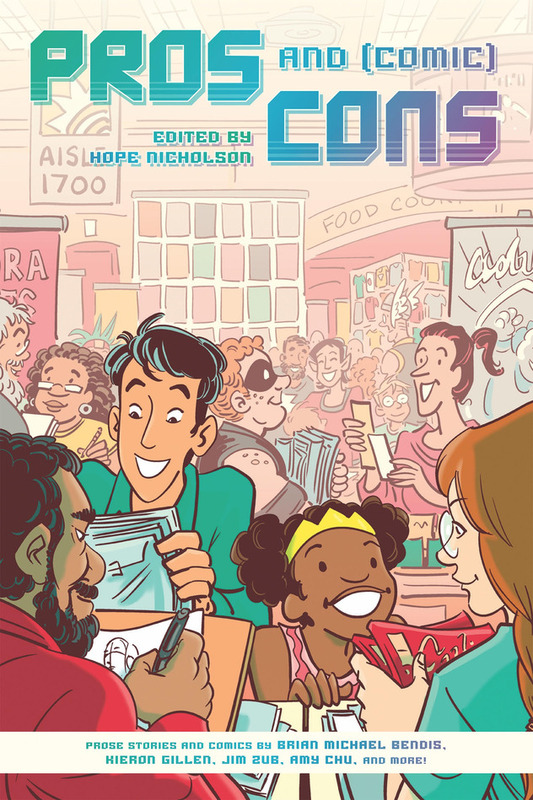 I’m beyond honored to be contributing to this book and super grateful for the opportunity to share my little story about what’s it’s like being a writer in Artist’s Alley at comic conventions (hint- it’s weird). 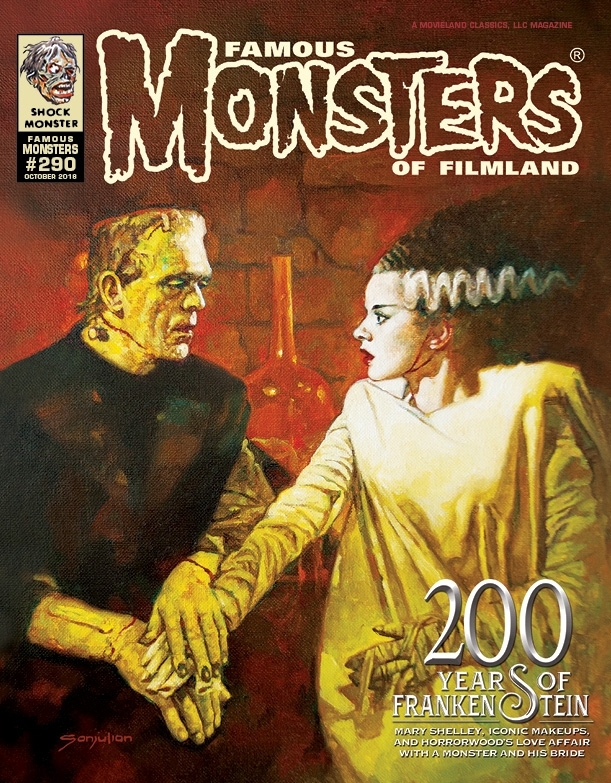 I have two feature articles in this year’s edition of FAMOUS MONSTERS OF FILMLAND magazine! It’s a huge honor to contribute to this legendary magazine. I covered John Carpenter’s incendiary THEY LIVE for its 30th anniversary (spoiler alert- it’s as relevant today as ever!) and also the 35th anniversary of a small independent picture called RETURN OF THE JEDI. Thanks to editor Holly Interlandi and the whole team out there in California for having this New Englander take part. 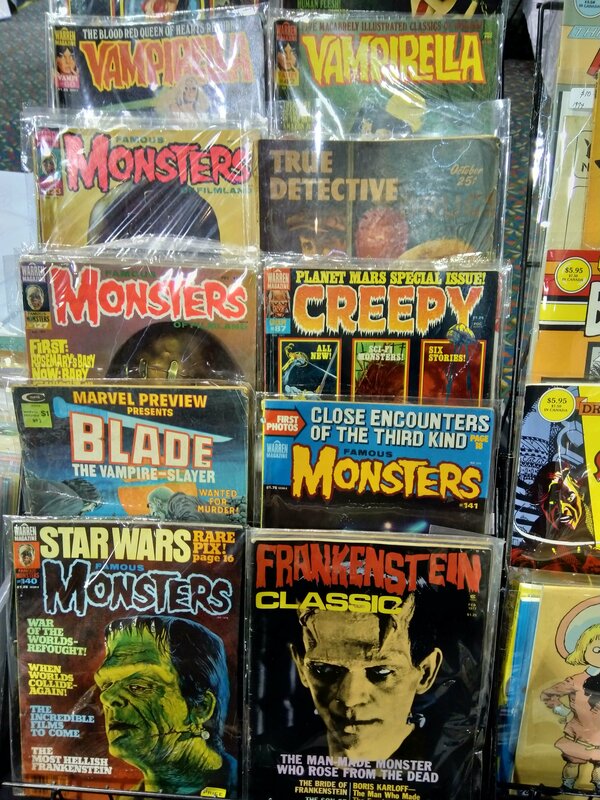 They’ve really put together an awesome collectible digest that’s sure to please monster and movie lovers. You can check your local comic shop for a copy (here’s the Previews listing, your shop might be able to order one for you via this if they don’t have any in stock), or your favorite bookstore like Barnes and Noble. You can also order directly from the Famous Monsters folks themselves, and I’ll aim to have a few copies added to my store as well.